By all rights, the UK's craft brewers ought to be toasting their success. The number of breweries in Britain is up almost two-thirds in the past five years and is back to levels last seen in the 1930s, new research shows. Yet the number of pubs continues to fall and is down 17% since 1996. So how do the micro-brewers sell their wares? Accountancy group UHY Hacker Young, which carried out the latest research, says the craft brewers "can't afford to rest on their laurels". "They will need to work hard to get their product into that limited shelf space and bar space," says James Simmonds, a partner at the group. One solution to the problem, as Croydon's Cronx brewery has found, is to start up your own bar. When Croydon's Boxpark development opened a year ago, the Cronx Bar was one of its first outlets, and it's done a roaring trade ever since. Mark Russell, who runs Cronx, says that with micro-breweries have now come micro-pubs. "It's getting our name out there," he says. "Lots of breweries are opening their own bars and pubs in old shops and things like that." The rise of craft breweries is certainly impressive. In 2012, there were 1,218 breweries in the UK. After years of consolidation in the industry, both locally and globally, the trend was towards mega-breweries offering increasingly predictable beverages. But by the end of last year, that had increased to 1,994, and has since broken through the 2,000 barrier, says UHY Hacker Young. "The UK has been going through a craft beer revolution, with sales of higher-margin artisan-style beers soaring, both at pubs and supermarkets," says the accountancy group. "The success of the pioneering craft breweries has attracted more entrepreneurs, some of whom honed their skills with homebrew kits, to raise money and open their own micro-breweries." The big supermarkets, of course, have been facing their own problems. But the decline in the number of pubs is more worrying for brewers, particularly as two thirds of all drink sales in pubs are beer. In 1996, there were 60,800 pubs in the UK, according to the British Beer and Pub Association. By 2012, the start of the craft brewery boom, it was down to 53,800, with just over 50,000 by last year. The association's Neil Williams says one of the big issues for pubs and brewers alike is the high level of duty on beer in the UK, which is three times the EU average. "The tax on beer is 39% of the cost and the chancellor is planning another increase in the Budget, after it went up by 4% in March," he says. "Beer is the key product for pubs and it's still one of the key drivers of bringing customers into the pubs." 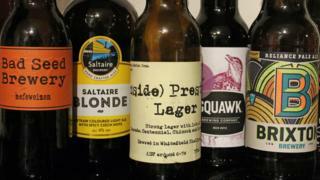 Given the economic pressures on micro-breweries, how are they faring? Cronx is a good bellwether for the industry, as it was founded in 2012 at the start of the craft beer boom. The firm started with £70,000 of funding - some of it put up by Mr Russell and his business partner Simon Dale, the rest provided by private investors. Right now, the company is undergoing an expansion, installing new fermenting tanks and other equipment, "just to keep up with the demand for the beer we're producing", Mr Russell says. "There's a view that the number of breweries will plateau out, because there's only so much beer that the nation can drink," he adds. "But there are people who are more concerned with quality than quantity, and locally produced beer will always be popular."